Canadian healthcare company nGageIT forms cutting-edge technology to inspect the nanoparticles of drugs present in the patient’s breath. It will prevent overuse of medicines by the patients. nGageIT has come up with a technology that makes use of digital solutions in healthcare to stand against the current scenario of the opioid issue. The company based in Toronto is one of the first companies in the world to utilize the inventive digital solution through its digital plans. The breath sensor technology aims to keep track of the burst of the epidemic dealing with the medication non-adherence. The company offers ways that could prevent the overuse of medicines that are prescribed by doctors. Researchers have been trying to solve the hurdle of handing the opioid epidemic since years. And they have been looking for a way to treat it in the best possible way. The patient adherence to painkillers and substitutes of opioids has become the new path that healthcare companies have been glancing over to find a remedy. 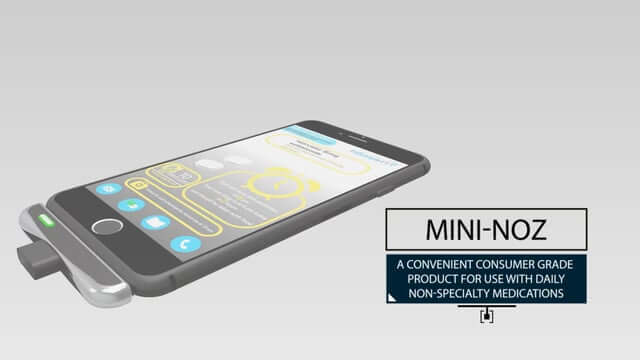 NanoSmart, the digital health product developed by nGageIT, can be used to check a patient’s adherence to their medication with the help of their breath. This is proven to be a more accurate bio-identifier as compared to fingerprint scanning or even facial recognition when medication is taken. The technology comes embedded with a biosensor detection device which is referred to as the “Noz”. To ensuring easy handling, this can easily be fit into smartphones. It does not require any additional sensor patches to be worn by the patient. The method of detection starts with the patient breathing into the Noz. As per the company reports, the dongle is capable of detecting and then identifying the nanoparticles of drugs present in the breath of the user. From over 2,500 substances in a human’s breath, the biosensor is capable of uniquely detecting a single digitally encoded nanoparticle. The information is collected to be sent and store on the user’s smartphone. This can be really helpful for doctors to be alerted when the patient is not following to take the prescribed medication. So, the device sends a notification to the doctor making them aware of the patient’s adherence behaviour. Medication adherence is a very important aspect to be looked into. It is essential as not following the proper routine for medicine intake can harm the patient in multiple ways. It could lead to more serious issues like disease becoming worse or even fatal for the patient’s health in adverse cases. However, with these issues, the technology is also coming up with better, enhanced solutions to reduce the problems of medication adherence. Nowadays, several mobile applications are existing to monitor the medicine intake of patients. One such instance was when recent studies revealed medical app has improved medication adherence in hypertension patients. Apart from the apps that can keep a record of medicine intake, there are ingestible pill sensors available. These pill sensors can be consumed by the patient either directly or indirectly to monitor their health. Technology is always coming up with better and more advanced solutions to help the healthcare industry. 9 Successful women healthcare entrepreneurs in GermanyHow is Amazon Echo helping people with vision impairment?